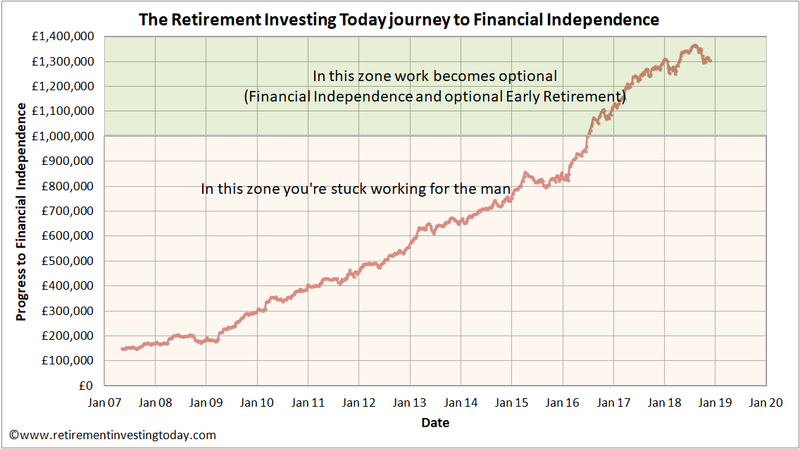 Retirement Investing Today: FIRE day! 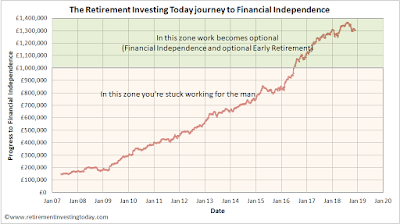 It’s an exciting time in the RIT household as I’m now calling myself FIRE, Financial Independence Retire Early. I’ve worked my notice period, completed a professional handover of responsibilities, was given a fabulous send off by the company I worked for, surrendered my identification card and then walked out the door. That’s just a whisker over £1.3 million. After buying a home I’m now down to just under £1.1 million. With that I need to generate enough income to fund the lifestyle we desire while also hopefully not running out of money before we run out of life. To calculate the maximum that can be I’ve consistently talked about using two criteria to set my annual spending. The first is based around the 4% or 25x spending rule. This rule is much bandied around within the FIRE community, many times without context, and now with FIRE potentially starting to go mainstream is starting to be bandied around in the more traditional media as well. Under the 4% rule I can now start spending a little over £43,000 per annum and then live happily ever after... Except I personally think that the 4% rule is too bullish a number which I’ve covered in a number of blog posts over the years. I’m much happier starting out spending 2.5% plus my investment expenses of around 0.2% giving me something closer to £30,000 annually. Doing the maths on that and I’m now closer to £24,000 annually. So is that no FIRE, lean FIRE, fat FIRE or as an early reviewer of my book ‘kindly’ suggested “..."penury", and with some justice”? The Office for National Statistics tells me that as far as total income before tax goes it would put me in the 52nd percentile of taxpayers in the UK but that’s not really helpful either. Instead I’ve tracked my spending for years and then built a spending plan for retirement which includes 47% discretionary spending and which tells me today that to live the life we desire we need EUR27,593 annually which at worst case historic exchange rates is £24,571. I’d call that just about right FIRE. So we’re set financially, now we just need to get ourselves packed up over the next few days and get on that one-way flight to Cyprus. Fortunately, our approach of focusing on quality of life, which leads to a certain level of minimalism, is making that process not overly stressful. But before that it’s time to pop a cork as a small celebration is in order. Hurrah! Best wishes for your future lives. Good luck with the change in scenery, decompressing, and finding new worthwhile pursuits now that you've conquered the FIRE mountain. Well done, RIT. Hugely pleased for you and very grateful for all of the insights you've shared along the way. Here's to your next step! Thanks so much for the wishes. It took me just under 9 years to become FI which in hindsight was the easy bit as it only required wealth to be built. It took 11 years to have the wealth and gain the courage to pull the trigger which resulted in more wealth than I think we'll need as a by-product. That was much more difficult as you can see from my ramblings over the last couple of years but we're now ready. Plenty of excitement and a little trepidation but it hasn't fully sunk in yet. I agree - this is the exciting bit ! Congratulations RIT and thanks for your posts, insights , data , projections etc. Thank-you as well for all the discussion over the years stringvest. Your comments have always made me think and you've definitely helped make me a better person and investor. Congratulations! So impressed that you have actually RE'd, which I think takes a lot of courage. And a drawdown tracker too, which will be quite novel. Best wishes in this new stage of your life. Thanks. There are now a lot of pre-FIRE blogs out there but not so many post-FIRE. Certainly not post-FIRE where work is 100% optional so sharing how I'm going to manage drawdown seems a worthwhile pursuit. Even if it's half as effective as what I've shared previously there will be plenty of thoughtful comment as it develops in both directions I'm sure. Nice nice nice... Congrats! I'm looking forward to future posts. Wondering how your life will be like compared to the busy London one. We plan to move from London to Greece in the next 5 years. That's a drastic change in our everyday life. Good luck to your new life chapter. Must be exciting. - Assuming Brexit actually occurs and we get a withdrawal agreement we'll likely be post that as well so understanding how you plan on getting into Greece would be interesting? Hopefully it's simply you're one of the lucky ones with an EU27 passport. Why Greece: Well, this is where I come from and I'd like to go back at some point. Good mediterranean food, warm weather and the option to sail and swim (if we end up in Rhodes). The tourist sector also offers many passive income opportunities for those with some money or time to spare. If I don't end up writing on the blog the whole day. Imho, tax optimisation, greek bureaucracy and dealing with the slow public sector will be our main challenges. There is a reason London is so expensive. As FirevLondon likes to say, quality comes at a price. Being half-Cypriot, I guess Cyprus is also an option for us. For FIRE people, it's a much better destination in terms of tax treatment. For entrepreneurs as well, (being online OR offline) as the LTD taxation is much more favourable compared to Greece. That sounds like a very good reason to pick Greece :-) I wish you much success in terms of your future location choices. Hi RIT - see comment above . This may be an impossible task . Do you have an easy way of showing graph 1 in euros ? 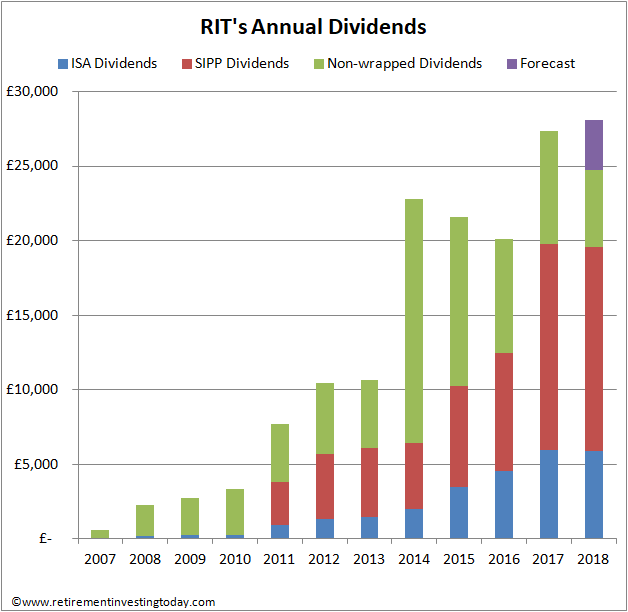 In your dividends chart you show divi's from your SIPP - presumably you are not taking these from your SIPP currently ? You have always stated that you discount the possibility of receiving any State pension - which you presumably are applying to your wife's finances as well. Are you planning on not drawing capital out of your SIPP and just take the dividends - long term ? Do you or your wife have occupational pensions that will improve your financial position when you can start receiving them ? What I am trying to establish is whether your published financial position is actually a sort of worst case scenario - ie you are being very strict about only revealing your personal financial position which is not the same as your overrall family situation. I think most people , when looking at their overrall financial position would look at the whole family's assets , but you have chosen not to . Do you think that is part of your character / personality and your relationship with money and risk ? I've done 99% of the work on how I plan to go from no pension to private pension (only SIPP's, no DB pensions) to State Pension (which as shared in a detailed post previously I don't consider and only use as an insurance policy). I did that before pulling the FIRE trigger. I just need to format it reasonably nicely and then write it up into a post which hopefully I'll do in the next few weeks as it could be relevant to a number of people. Your questions are as always good ones so let me have a go at them now though. Do you have an easy way of showing graph 1 in euros? I only really started tracking EUR:GBP closely in late 2015 so don't have that chart exactly. My plan in the short term is to stay a 'UK Investor' and just use an exchange rate of 1.123. If we love Cyprus after a few years I would think I'll transfer to a 'Euro' investor via a gradual shift of asset allocations. My tracking would then likely shift to Euro's as well. In your dividends chart you show divi's from your SIPP - presumably you are not taking these from your SIPP currently? Correct. My plan is to take non-SIPP dividends and sell down non-SIPP wealth to the equivalent of 85% of total (SIPP + non-SIPP) dividends. This means with time my % of total wealth in the SIPP should increase. In my mind (which I guess is all that matters) that's not selling down assets. Does that make sense to you? 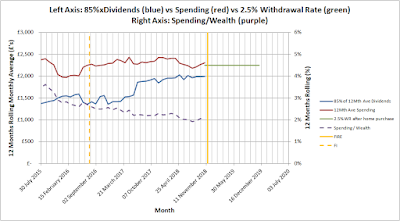 Are you planning on not drawing capital out of your SIPP and just take the dividends - long term? To a point but I think Benefit Crystallisation Events (BCE's), assuming they still exist, are going to get in the way meaning once I can access my private pension I may need to also start drawing down SIPP capital which I can then reinvest outside the pension. So up to age 55 non-SIPP as a % of total will shrink but then post age 55 non-SIPP as a % may increase. This will just be moving money around with me still just spending 85% of dividends. It's a big advantage of Cyprus as they (currently) allow two tax routes for pension access with one of them being a flat 5% rate of tax on the pension. Do you or your wife have occupational pensions that will improve your financial position when you can start receiving them? No, we're fully dependent on the thousands of companies we own a little piece of. What I share here is the total of what we have to live on plus a bit of Mrs RIT fun money. Hopefully I've been very transparent and consistent with that over the years. I think most people, when looking at their overall financial position would look at the whole family's assets, but you have chosen not to . Do you think that is part of your character / personality and your relationship with money and risk? That's a long story which I'm not ready to share yet. It suits us for now though. As I've shared previously as far as this blog goes it's a bit of a distraction as it's her 'fun money' just like a significant chunk of the £24k I mention above is my 'fun money'. Maybe with time I'll share the family unit but we're not quite there yet. Thanks RIT for your detailed and prompt reply - also for your comments. It is your honesty and willingness to " expose " these aspects of your life that have made me want you to benefit from some of the things that I have learnt over the years - not just as an investor but also my work as a GP, and as someone with quite different thoughts and attitudes to yourself . Wishing you and your family the very best of luck - no matter how carefully we plan - a bit of luck always helps . Plan for the worst ( which is part of your nature ) and hope for the best. Congratulations, RIT! Thanks for being an inspiration and for documenting your journey - there is no other blog like yours, aiming for FIRE, achieving FIRE, pulling the FIRE trigger, all through your own hard work and following your solid plan! The next part of your journey promises to be very exciting. I wish you all the very best for you and your family and look forward to reading your updates on your drawdown strategy and new life in Cyprus. Many thanks for the wishes and the hat-tip weenie. I continue to follow your journey with interest and cheer on that high savings rate every month.You'll also be FIRE before you know it. Congratulations and thanks for the blog (and the book which I've read twice). Just back from a week in Paphos, celebrating a 'milestone' birthday for Mrs C, and I think you've made a brilliant choice. Great climate, friendly folk and very Anglo-philic. They drive on the right (left) side of the road, they use proper English electricity, English is widely spoken, I only saw one sign the whole week that wasn't bilingual, there's loads of history to go look at if that's your thing and they have Marks & Spencers. Thanks and glad to hear you enjoyed Paphos. Interestingly when we did the final location assessment we actually scored some of those things negatively. For example English being widely spoken. When we thought about getting established quickly and easily it helped us score highly but when we thought about probability of fully integrating with the community we scored it lower than Spain. The reason is that with Spain we knew we would need to become fluent in the language but with Cyprus that pressure is just not there. Have fun RIT. Safe travels. Hi RIT, congratulations. I hope you will continue to post after FI. I too will be FI next year and I had two main concerns: 1. Retirees can suffer a scarcity mindset living off amortized assets. Imagine going through a 50% bear market and your withdrawing 4% at the same time. Hence mine is a pure cash flow based model of dividend stocks and rental real estate. 2. Achieving FI is a gift that the majority of people will never experience, however the responsibility to live a fulfilling and interesting life resides entirely with you now. Best Regards, Jon. It is definitely my current plan to keep posting. I suspect with time I'll write less on the financial side of things as I think drawdown will be a simpler state of affairs but I'll write more on your point 2 as I've just gained an extra 70 or so hours a week. Congratulations! Are you going to continue with the blog once you reach Cyprus? A post FIRE perspective would be interesting. Anyway, good luck in your new life. Thanks Willy. As mentioned to Jon definitely plan to keep writing. There's a lot of pre-FIRE blogs out there but not so many post-FIRE so hopefully I can add a little to the FIRE collective. Congratulations! Although I live in a country far away from where you are, I can still feel the excitement and happiness radiated from your blog!! Fat or lean FIRE, you're a retiree now! Wish you all the best in your FIRE life!! Thanks so much for the wishes Ryan. Are you on a FIRE journey? Congratulations. I'm not sure if I've ever commented before but your blog has been a very interesting and useful resource so thank you for sharing. I have one small question about the final chart 'RIT Drawdown Tracker'. The red series which is marked as '12 Mth Average Spending' is a little unclear to me. Is this your historic actual spending going back to 2015? (It seems to be too high) Or is this some hypothetical retirement spending extrapolated from your current spending (with an additional GBPEUR exchange rate adjustment)? To my eyes the chart makes it look like your current spending (approx. 2300 per month) is higher than both your 85% Ave Dividend income (2000 per month) and the 2.5% WR (2250 per month). Sorry if my question isn't clear or if you've already explained this in the blog. Good spot Hague and I should have clarified this in the post. 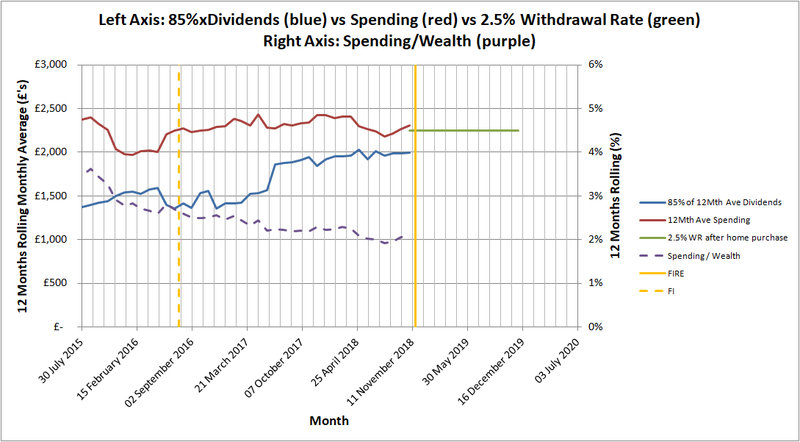 Each red data point is an average of the previous 12 months spending so effectively a monthly spending moving average. There's a couple of reasons it's so high. Firstly, during the accumulation phase I chose to rent in the South East of England as it gave me the opportunity to earn more than the after tax rent cost and so helped accelerate my time to FIRE. It was a significant cost at 55% of my total monthly spending. In FIRE after a 6-12 month rental period, at a much lower rate, we plan to buy. That money is held in cash so isn't spinning of dividends and you'll note the 2.5% WR has an assumed home purchase cost already netted off. Secondly, I now won't have work costs which for me ran to 10% of my spending. At the other end of the scale as we now have more time I'm also planning to spend more on new activities. That's why I tracked my spending religiously and then was able to build a ground up FIRE budget which will see us spending less than we do today. Therefore with time I expect to see that red line trend down and over the long term wobble around the blue line. It makes sense. I recalled that you also created a data series which tracked your numbers without rent and without work costs so I had assumed that was the number you were using on the chart. A great set of articles. Would you mind advising how you got such a dramatic increase in dividends after 2013? Was it a result of a change of investment strategy? Congratulations RIT. I've been a long time lurker on your blog and am really happy you have FIRE'd. Good luck with the drawdown phase and looking forward to your post FIRE articles! Congrats on pulling the trigger RIT. I've admired reading your stuff for a while. 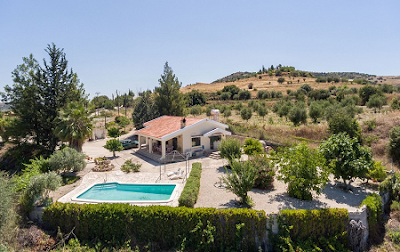 Cyprus is certainly a buyers market and you should be able to have your pick from an undervalued supply of property. One cavil. Don't cash in your ILSCs. Even if you return to Britain someday you won't be able to replace them. Shares you'll be able to replace. Shares within ISAs you will probably be able to replace. But not ILSCs. Cling on grimly. Wow.. it really looks great for you! Well done! Congratulations. I think pulling the trigger is the most difficult part. I'm a naturally cautious person and want to build in a large margin of safety before a potential one-way shift out of the job market. At the same time, I need to balance caution with not working unnecessarily. Many congratulations RIT. For me, the most interesting part of the whole FI/RE journey is reading what and how people do once they reach their number. Sadly, this is when many blogs become quiet and understandly because they now have more interesting things to do. I hope you continue to write and enjoy this next stage of your life. Pops 321 here. Brilliant you have left and really interested in your progress longer term and what that brings. As we have mentioned before I am close on your heals abd retire in a few weeks aged 50. Although my strategy differs in that I will continue to live in North Yorkshire our principals around spending and saving have been the same....but yours much more disciplined. My run in is much more bumpy with handovers and replacements for my role taking more time and I may even need to add a couple of weeks to my end date....but spiritually I will leave at Christmas and anything after that is ‘handing over the work’. Really interesting you keep blogging (if that is your wish) and inspire others see there is more than working and acquiring. So many people in their late 50’s at my work will not leave...just too scared, “what will they do” and do they have enough. They do have enough and not knowing what they will do is so sad....defined by school, early career and now work they fear without that they are no one. But as I leave I know I can become my true self, keep really fit and active, enjoy being in the moment a lot more and enjoy every single breath I take knowing what a wonderful life I have. Best wishes. Stay in touch.